The shadows are lengthening and the ferns are yellowing. More signs of changes to come. Mine are onto the very brown and shriveled stage. 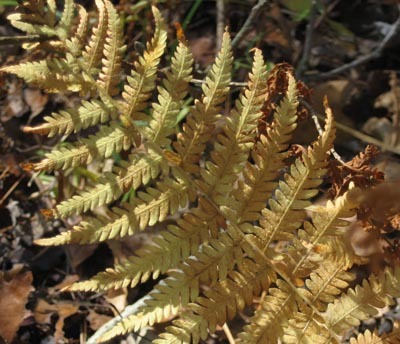 Ferns are so pretty, from unfurling in the spring, through their yellowing in the fall. My changes are arriving around noon today. We had almost mid-60s yesterday — there will be snow measured in inches today. Presto Change-O. Isn’t it interesting how the light changes too. Today promises to be gorgeous! Ahhhh it’s fall. My plants are still in pretty good shape. But it won’t be long and they’ll all be crispy. You know, I am totally impressed that you blog as often as you do 🙂 and your photos are so wonderful. thanks for the lovely eye candy. We’re having flooding out here, and all the plants are almost past their color. Very pretty in a dry, sere kind of way (grin). Love your pics…I just love this time of year. The colors are so vibrant and there’s always a promise of renewal in the Spring! Eveything looks the same here. We don’t know what time of year it is! Lovely picture! Eye candy, for sure! I can almost hear the crisp sound of your feet as you walked over to photograph this. When I first glanced at the photo I thought it was a gilded fern, some kind of Christmas decoration. Pretty! And it’s cold – brr!